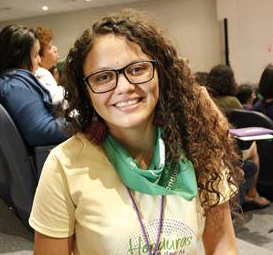 Shari is a young Honduran woman, committed to the rights of youth and women. She became involved in child and youth organizing and participation processes from a very young age and has become a leader in the southern region of Honduras and at the national level in the promotion of human rights and women’s rights. She is studying a degree in sociology and is the leader of the “Feminist Training School” project focused on educating, empowering, developing and strengthening the leadership skills of young women.